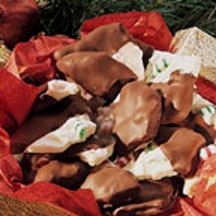 A festive candy treat, these chocolate peppermint wafers are great for parties or just to have around. Line an 8-inch square baking pan with foil. Microwave baking bars in medium, microwave-safe bowl on MEDIUM-HIGH (70%) power for 1 minute; stir. Microwave at additional 10 to 20-second intervals, stirring until smooth. Stir in candy. Thinly spread in prepared baking pan. Refrigerate for 10 minutes, or until firm. Remove foil and break into bite-size pieces. Line baking sheets with waxed paper. Microwave morsels and vegetable shortening in a small, microwave-safe bowl on HIGH power for 1 minute; stir. Microwave at additional 10 to 20-second intervals, stirring until smooth. Dip candy pieces 3/4 of the way into melted chocolate; shake off excess. Place on prepared baking sheets. Refrigerate until ready to serve.